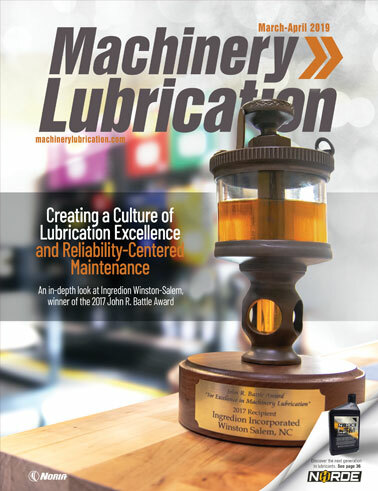 Sealable and reusable (S&R) containers are becoming more and more popular in the lubrication industry. These containers, which come in many different styles and sizes to fit your needs, can have a quick impact on your lubrication program, helping to prevent particle ingression into new oils and cross-contamination of different oils. In the majority of cases where an S&R container is utilized to transport and distribute fluids, the system is open and the container can be cleaned with traditional cleaning methods using detergents or soluble compounds. There are several “green” formulations as well as acidic-based (lemon juice, etc.) solutions that when combined with elevated rinse temperatures will leave a minimal residue within the drum and nozzle. For these methods, the drum and nozzle should be detached and wiped down, then rinsed at an elevated temperature with a detergent or acidic solution. Most detergents will work, but avoid highly polar solvents such as acetone or methyl ethyl ketone (MEK), which can attack the O-rings and seals on the lids. Once rinsed, the drums and nozzles can be air dried and filled with the new fluid. Flow a small portion of fluid through the nozzle to eliminate contaminants that are still present after drying. If you are working to improve cleanliness levels/codes or moving toward a closed system, you can use closed containers via quick-connects on the lid to filter fluids moving through the drum, in effect pulling out any residual contamination. Particles and moisture can enter lubricants from various sources and entry points. Many of these contaminants appear in lubricants as they are being handled and transported from the blend plant to the ultimate point of use in a piece of equipment. For small machines, a surprisingly large amount of contamination can be introduced during the last stage - between the bulk or intermediate storage (drum or tote) and the machine itself. This is where an S&R container can play a vital role in controlling contaminant ingression during routine oil changes and top-ups (the introduction of makeup oil), if the container is handled correctly. Proper care of an S&R container is critical. This includes leaving the containers sealed when not in use, having them properly labeled to prevent any cross-contamination of different oils when refilling the containers, keeping the containers clean on the inside and outside, and storing the containers in a nearby cabinet when not in use. One way to prevent contamination from getting into an S&R container is by using quick-connects on the hand-pump models. If you install a female quick-connect on the hose end and a male quick-connect on the S&R container, the container will remain sealed from any outside contaminants that may be present, even when refilling the container from your bulk storage. It is also important to keep S&R containers clean. Taking clean, filtered oil from bulk storage areas (drums and totes) and putting it into an S&R container that has been sitting around with the lid off collecting dirt particles or moisture, or simply using the same container for all oils is a waste of time and effort. Machines must have clean oil. 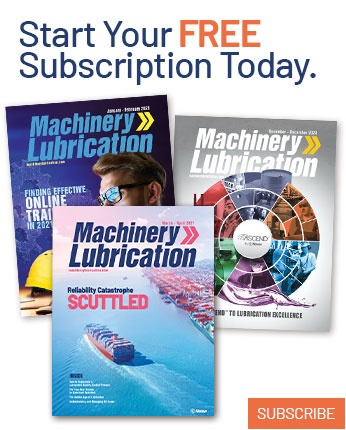 Utilizing S&R containers correctly to top-up your machines can help propel your lubrication program to new heights. If a container has been left open (with the lid off, spouts open, etc.) for a long period of time, the oil remaining inside should be drained out and the container cleaned. During use, containers will become dirty on the outside when coming into contact with oil, dirt or equipment. Set a routine cleaning schedule for the containers based on the number of times they are refilled and used or employ a monthly schedule. Avoid cross-contaminating oils in the same container. If this occurs, the container should be drained and cleaned. Dispose of any remaining lubricant into a proper waste container. Use a sponge to thoroughly clean the inside and outside of the container with warm water and soap. Be sure to rinse out all soap with warm water. Wipe the container dry using a lint-free rag. Automatic parts cleaning systems have recently burst onto the scene to help with cleaning S&R containers. These types of systems allow for continued workshop productivity by eliminating the process of cleaning containers by hand. Instead of hand-cleaning each container one at a time, an automatic parts cleaner enables multiple containers to be cleaned at once while you return to your work. 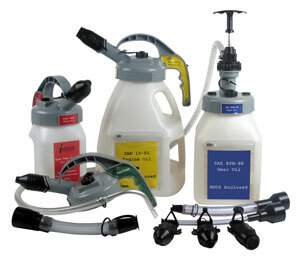 Purchase enough containers so they can be dedicated to work areas and lubricant types. Don’t share containers and risk cross-contamination of lubricants. Store S&R containers in lockers near the point of use to keep them clean and safe. This also enhances convenience (top-ups are more timely) and minimizes the risk of cross-contamination. On the container label, mark the date when the container was last cleaned and when it should be cleaned again. Always take note of any sediment, sludge or water. If any is detected, troubleshoot the source to prevent future introduction of contaminants into your machine. Keep the outside of the containers wiped clean, especially the nozzle and handle areas. Train all operators and lube technicians on the proper use of S&R containers.